As a parent, you likely will want to remember how precious and tiny your child once was -- or measure how she's growing over time. You can do this by preserving your child’s handprint, which makes a great keepsake or gift for grandparents. You can safely get your child’s handprint with several craft mediums. 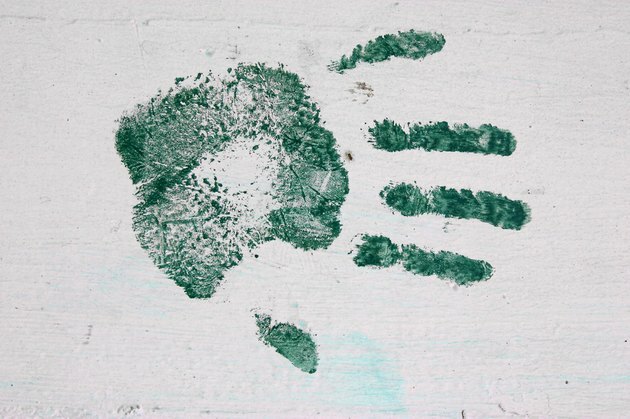 You will want to choose non-toxic, washable paints to capture your baby's handprint on canvas. You can find non-toxic craft paint in the children’s craft section of your local craft store. Prepare all the necessary materials ahead of time. For this project you'll need craft paint, a paper plate, a canvas in the size of your choice and wipes or damp paper towels. Pour the craft paint into the paper plate in a puddle slightly larger than your baby’s hand. Gently spread out your baby’s hand and press it firmly into the puddle of paint; exert even pressure to get good coverage -- and move quickly. Press the painted hand on the canvas with even pressure as well. Immediately wipe off the paint with a wipe or damp paper towel. Allow the print to dry and add paper letters or paint on pertinent details such as the name, date and age of your baby. Polymer clay is a non-toxic crafting medium that can preserve a child’s handprint for many years. When purchasing polymer clay, ensure that it's non-toxic. Polymer clay hardens in your oven. Work the polymer clay with your hands until it becomes warm and malleable. Form the clay into the shape of your choice, such as a heart or circle, and then place it on a cookie sheet covered with aluminum foil. Spread your baby’s fingers out and press his hand on the clay to create an impression. Remove your child’s hand and wipe it clean with a damp paper towel or a baby wipe. Use a straw to create a hole in the top of the shape -- and a toothpick or a craft knife to write your child’s name or the date in the clay if desired. Bake it in the oven following the package directions, keeping a close eye on the clay to prevent burning. After the clay cools, you can paint it the color of your choice and add a decorative ribbon so you can hang it on the wall. Most parents have an inked footprint provided by the hospital when the baby was born. You can create the same types of prints at home. All you need is baby-safe ink, which you can find found in craft stores, a heavy piece of craft paper, a hard surface and baby wipes or a damp paper towel. Place the ink and paper on a hard surface such as a table or book. Spread your baby’s hand out and apply the ink by pressing the pad on your baby’s hand. Immediately press your baby's hand on the paper -- and then wipe her hand clean with a wipe or paper towel. Allow the ink to dry before moving the paper. Babies, especially newborns, are typically heavy sleepers. To ensure you have adequate control over your baby’s hand while making the print consider waiting until your baby is in a deep sleep. You can check this by gently lifting his arm and letting it drop. If you baby doesn't stir, she's in a deep sleep. Consider setting up several pieces of clay, canvas or paper to ensure that you can move on to another piece if the handprint doesn't come out right on the first try. Babies often put everything in their mouths, so it is important to keep control of your baby's hand and wipe it clean immediately after making the handprint.